You are here: Home / Welfare / Adopting a rescued angel! Adopting a traumatised animal needs much more care and attention than a puppy. I recently encountered a case of three traumatised Beagles who eventually found homes. Read about Nube– one of the three beagles. Dr Aparna Bhatnagar shared the whole rehabilitation process of Nube with me as I captured it on my lense. Recently PETA India won a battle against animal testing and rescued 70 Beagles who were held at the quarantine department in Chennai. Many concerned volunteers of various organisations and animal lovers lined up for hours during the release of these poor little puppies who were brought from China. I am a pet photographer by profession and I rescue and foster animals and help abandoned pets find home. So, when I heard about the Beagles rescue operation I volunteered to foster a few of them until they found a good and a permanent home. As the rescued beagles finally found homes, I met with three beautiful six-month-old Beagles who came home, wagging their tails. These puppies were kept in cages in the quarantine department for months, with no love or special care that every little pup deserves. Filled with fear and confusion and exhaustion, three of them just sat by my feet for hours. These puppies have never slept on a mat or any soft surface and for the first time in their lives, they had their good night’s sleep…by my feet on my bed. I couldn’t sleep all night, I just watched them and thanked God they were finally safe. It was heartbreaking to see the serial number tattooed on the insides of their ear lobes; it is one of the most disturbing things I have seen. None of these three puppies made any noise, not even a squeak. They haven’t barked till today. This rescue was a complete eye opener for a lot of people here in Chennai about animal testing and personally I have taken an oath not to use any product that is tested on animals. I had the opportunity to shoot two of the most adorable Beagles in the city – Nube and Tabe! After hours of playing and kissing and many licks to my camera lenses, I managed to capture some precious moments with the entire family. Nube a.k.a New + B a.k.a New Beagle has a different story. She was one of the three rescued Beagles from the rescue operation by PETA against animal testing. 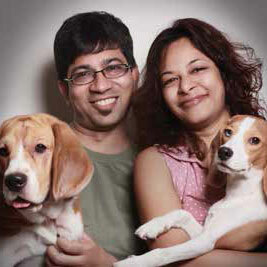 Dr Aparna Bhatnagar and Dr Tarun Bhatnagar were one of the happiest parents to adopt Nube. Nube is bi-eyed but this wonderful couple didn’t hesitate even for a moment because they were excited to take her back home to Tabe, their adorable pampered three-year-old Beagle who fell in love with Nube instantly. It’s rather a challenging process to get an adopted pet to adjust with the existing pet. Q: How was Nube’s first day at home? Dr Aparna: Tabe is a very social animal (laughs). He likes people and he has been to many pet parties before. It’s amazing to see him interact with other dogs so nicely. We weren’t too apprehensive about his behaviour with the new member – Nube. Tabe welcomed the new member with sniffs and his share of cuddles for Nube. As for Nube, she was scared, reserved and a little quiet when she came home. She would hide behind the sofa and table. She looked very sad and under shock. She gradually became comfortable with us and Tabe. Now, she really likes his company and you can’t find them apart. Q: Did Nube show any signs of abandonment or prior abuse? Dr Aparna: Yes. Definitely. Her body language showed how scared she was when we first saw her. She took a little time to trust us. All she wanted is our constant touch, whether sitting, walking or even sleeping. Q: How is Nube different from other dogs? Do you think she needs special care? Dr Aparna: Nube was a very quiet puppy when she came to our house. She would not bark at all and did not make any sound/noise even after she became comfortable with all of us. It came as a big shock to us when we came to know that she had been subjected to utter cruelty and that her vocal cords had been surgically removed in the past. I could not control my tears and was sad for almost two days thinking about all the pain. Nube had to go through at such a young age. We are more careful and caring to her keeping in mind that she would not be able to bark or make any vocal gestures if she is in pain or distress. But this would definitely not make our love for Tabe any less. Both will always be equal to us. Q: Does she show any signs of fear of cages or confined spaces? Dr Aparna: We have never put her in a cage or confined space, so not really sure if she is afraid. She definitely knows how to get out of confined spaces and traverses across the grilled gate and window with ease (laughs). Q: Your personal note about your loving family and your special moments. Dr Aparna: Our lives changed for good when we got Tabe into the family. Nube just made it better and livelier. She brings with herself the feminine delicateness with a sharp mind and determined nature. Her actions speak louder than her words…literally!! Adoption is a very noble act. It requires a lot of commitment and compassion, it is so wonderful to see more and more people have evolved to understand this. We have the responsibility and the power to change lives, be it a cat, dog or even a little bird; if we can, we must. http://www.dogsandpupsmagazine.com/wp-content/uploads/2013/08/027-f.jpg 141 265 Dogs and pups Magazine http://www.dogsandpupsmagazine.com/wp-content/uploads/2017/05/1254nal.jpg Dogs and pups Magazine2013-07-19 16:48:182014-02-07 17:47:30Adopting a rescued angel!